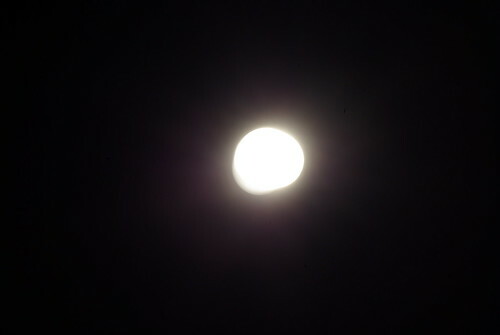 We had a full moon last week with unusually clear skies. 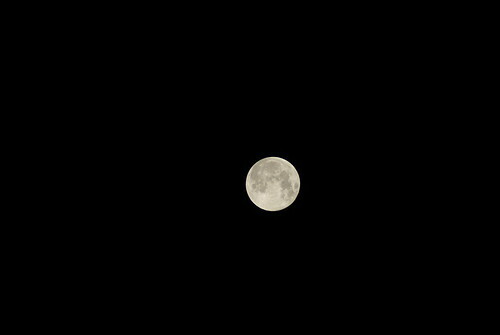 At about 2:00 AM, I headed out to the roof with the zoom lens to take some pictures. Why 2:00 AM? For one thing, I wanted to get it done before it got too late. For another, I had to wait for the moon to come out from behind the buildings. And I wanted to get out there at a time when the neighbors were less likely to call the cops about the guy with the zoom lens. It's a pretty poor image. It's a 30 second exposure at f/45. 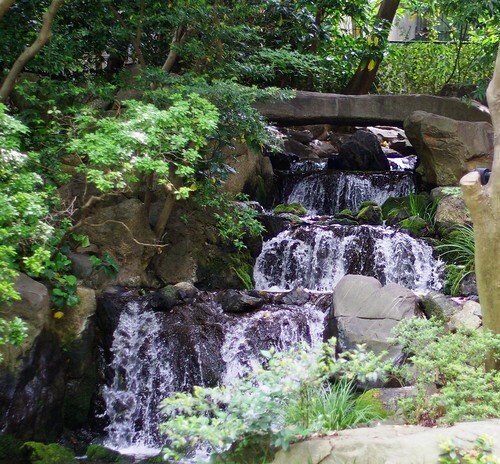 The problem is that even with the tripod, there is still subtle vibration that blurs the image. Plus, when shooting the moon at night, instead of in Hearts, you have to content with the atmosphere. Even a clear night still has water vapor and atmospheric disturbances. Plus, it is 240,000 miles away. All of that impacts a long exposure. The other issue is the fundamental flaw in my approach. I assumed since it was night, and I was shooting in the dark, I needed to do a long exposure due to the lack of light. And if I was shooting something on the Earth, that would likely be the case. But the moon isn't a dark object on the street. It's a giant mirror reflecting massive amounts of sunlight back down to the Earth. I played around with the shutter speed some more and it turns out the shorter exposures gave me better results. This is 1/3000 of a second at f/5.6. It's dark, but it's crisp. In this images you can start to see more of the craters and scars on the surface. I went up the shutter speed scale, taking pictures as each step, from 1/3000 of a second to 2 seconds. This is one of the sharpest (though tomorrow I may prefer the one before or after it). 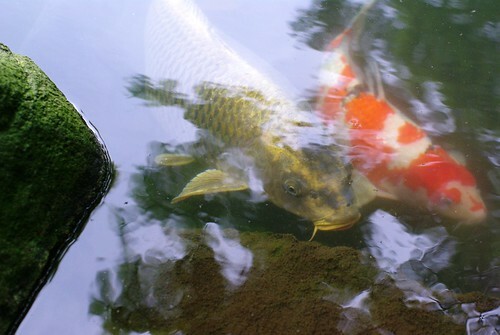 This image is is 1/250 of a second at f/5.6. Last week, I did a day of presentations in Indianapolis. They seemed to go fairly well. Many people who have trouble with public speaking get caught up in nervous aspect of it. There are a number of techniques that people can use to address that. For all the attention that nerves generate, it's easy to overlook the physical aspect of it. Because there's often no heavy lifting, many speakers overlook just how physically draining a day of speaking can be. Projecting and speaking loudly enough to be heard by 40 people in a conference room for a total of 8 hours puts takes physical energy. A day of speaking is tiring, and can be dehydrating. Not only are you taxing your body by projecting your voice, working with your voice, and running your mind at a different pace to speak well, you are also putting more moisture into the air from the sheer act of speaking loudly. Drink plenty of water. That's the mistake I made. I failed to consume a gallon or more of water during the event. By the last 30 minutes of the last presentation my voice was starting to break and my train of thought required significant concentration. By later that evening, tired and dehydrated, whatever bug I'd been exposed to on the flight out to Indy saw it's opportunity and jumped on my back. I spent the next several days fighting off a cold. I know, trauma almost as lame as the Gypsy curse I discussed earlier in the week. The point is that when you are speaking for a day, remember to drink plenty of water. It's not just to keep your throat clear. It's because the body and mind need plenty of water to continue functioning properly. 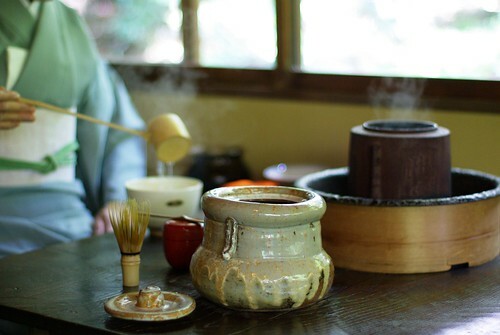 The second stop on our Hato bus tour was a Tea Ceremony at the Happo-en Garden, a beautiful facility popular with tourists and weddings. 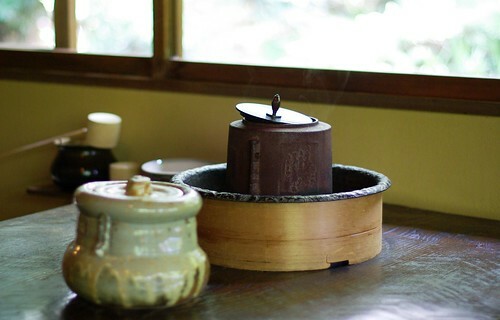 A traditional Japanese Tea Ceremony can easily run more than two hours, and it is an elegant, peaceful, and spiritual event. It's highly traditional, with history dating back centuries. You can learn more here. We had the 15 minute version. I imagine there are traditionalist who consider the type of activity we had to be an offensive dilution of cultural heritage. I am fully aware that we did not have a truly authentic experience. We had one for tourists. I'm okay with that. We had a snapshot of the experience. 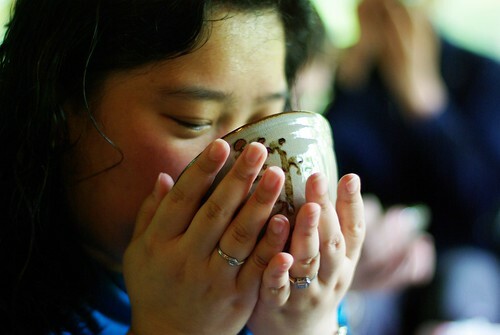 They split our group into two smaller groups and funneled us into the small tea house. They asked that we step over, rather than on, the threshold because it's so old. That may have been a mistake. One thing I learned when I took my motorcycle riding class (stop laughing) is that you should not look at obstacles in the road. You should look at the path around them. If you look at something, you will hit it. And many people, while focusing on avoiding the threshold, naturally ended up stepping right on it. I like the steam coming off the pot in these images. 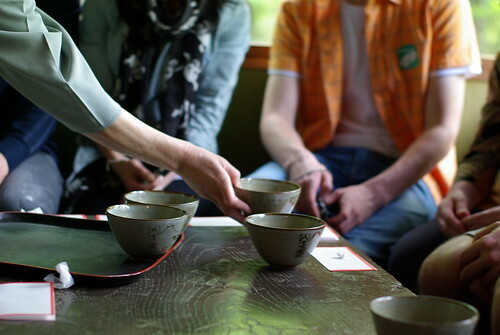 One we were seated, our tour guide and the hostess explained the ceremony and its importance, they discussed details, such as where the most important guest sits, and talked about the different implements involved in making the tea, or Matcha. 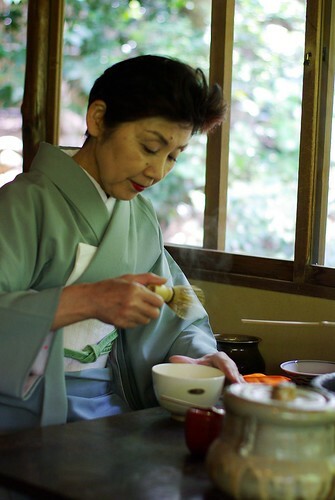 She made the first cup of tea while we watched. They served the tea to the 20 or so of us in the room from a separately made batch, Food Network style. 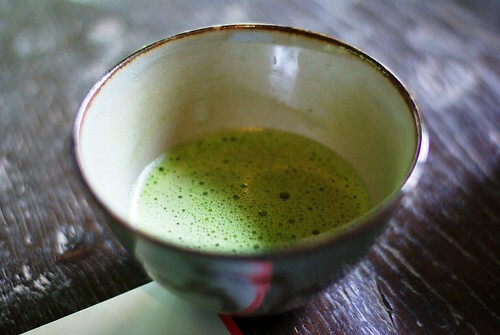 The Shoebox Chef gives Matcha a try. It's a taste I wasn't terribly familiar with. It has a slight bitterness to it, I suppose. I don't generally do a good job describing flavor. But I enjoyed the Matcha. I must have. Because later in the trip I had Matcha ice cream (excellent), a Matcha Latte at Starbucks (okay, but perhaps a little weird for me) and Matcha Kit Kats (which were awesome -- stock up at the airport). After our cup of tea, we were off to wander the grounds, while the next group came into the tea house. 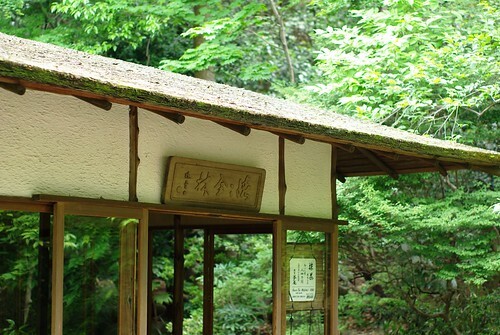 Immediately outside the tea house, the grounds hosted a shrine. 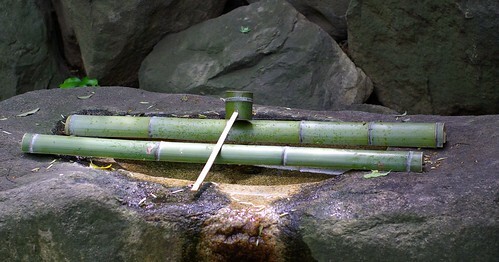 This is the purification station for the Daigo Shrine. 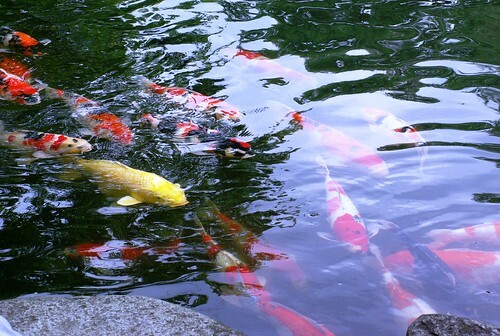 The grounds also had a lovely Koi pond. 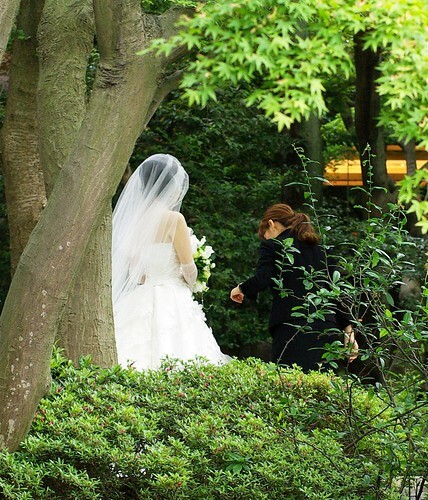 We also had a back stage view of wedding preparations as several wedding parties were there getting pictures taken. 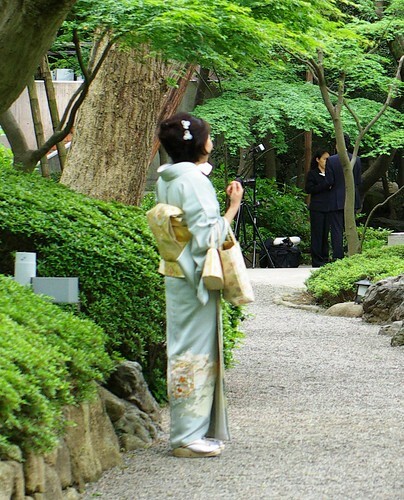 A guest in a kimono chats on her cell phone. It was just a taste of a traditional experience, and I'm grateful we had the chance to participate. It's also one reason I'm glad we took the bus tour. I'm not sure I'd have figured out how to set this up on my own. Saturday at Fred Meyer, I stood in line behind one person. I had 20 5' tomato stakes, 4 tomato cages, and a spook of twine to purchase. The woman in front of me was attempting to purchase an outdoor furniture set and table umbrella. It was a display model, on sale, and she had been all over town. With the special pricing, the cashier had a to call for multiple manger overrides. Then the customer pays with three different gift cards (which required yet another manager override) and cash. She fished out exact change from her purse, and dropped some of it, to wrap up her purchase. The customer and cashier apologized to me for the delay. I said it was okay because I knew it would happen. Regardless of the line I choose, it's the wrong line. Her troubles were probably because I got in line behind her. And that's the curse I live under. No matter what line I choose at Home Depot, Fred Meyer, Costco, QFC, Safeway, or any other store, I choose the slowest line. I can choose the shortest line, or the fastest moving line, or the most efficient cashier, or any other scenario, and that line will instantly become the slowest one at the store. It used to bother me. Eventually, I accepted it. I know that any line I get in will be the worst choice, so I don't even try to pick a quick one anymore. I just sigh and pull out my phone because I'll have plenty of time to read through my Twitter stream. The GF has gotten used to me making her choose the line when we go to a store. Occasionally, I'll pick the line, the curse kicks in, and she is able to redirect us the a better one. As long as I'm not the one picking the line, we're fine. Otherwise, we're spending the night in the store. I'm not sure what I did to earn this lamest gypsy curse ever. Did I annoy some long dead gypsy relative? Look at someone funny in 1994? Did I take it as a disad so I could spend the points on some other stat? I'd investigate it further, but I'm guessing there's a line. 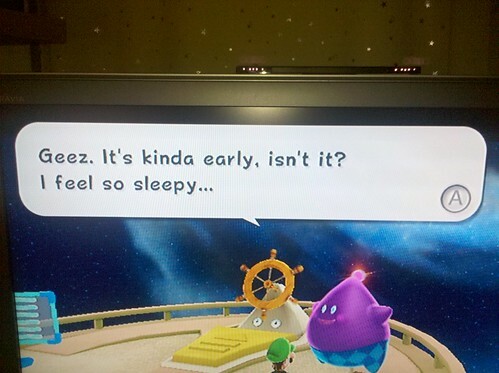 The other night I made significant progress in Super Mario Galaxy 2. But I guess I was playing kind of late. You know it's time to put down the controller and go to bed when the game is telling to put down the controller and go to bed. This year's crops are off to a good start. So far I've had only a few failures (mainly Romas and Peppers, though the Broccoli didn't turn our quite right either). That made it easy to make a salad today. The Endive in a regular self watering pot and the Romaine in an Earthbox are both doing quite well. They grew with little attention and were even easier to harvest. I rinsed them off, tossed them in the salad spinner for a few turns, poured on some Ceasar dressing, and sprinled on powdered Parmesian. In a few minutes I had quite the tasty lunch. I guess this is quhy I keep growing stuff. This mess waited for me when I got back from last trip. It took me awhile to figure out what it was. Syrup? Chocolate? Blood? Or *gasp* WASTED COFFEE?!?!?!?! Then I figured it out. It wasn't coffee (thankfully), and I haven't owned syrup in years. 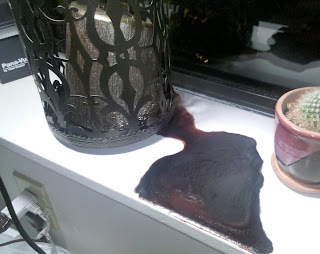 Apparently it go so hot in my apartment while I was gone that the candle (last lit for Thanksgiving) melted from the bottom up, began to collapse on itself, and drained on to my window sill. Maybe traveling in the summer isn't such a bad idea. I recently worked an event where my company held a drawing. People filled out cards to enter the drawing, and we asked them for name address, phone number, email address, and age (for legal reasons). Some people asked about what we plan to do with the information, but most didn't. What puzzles me is the fields people left blank. If someone was going to leave a field blank, more than 85% of the time (rough guess), they left the email field blank. They had no problem giving us their physical address, or their active phone number, but they felt the need to protect that email address at all costs. Spam annoys me. A little. But I would much rather get 500 Spam messages a day than get one telemarketing phone call in a day. Or 10 pieces of junk mail. Spam is easy to delete -- it's just one press of the delete key. I don't have to listen to anyone or be jarred out of a contemplative state by a ringing phone. I don't have to pick up and carry anything. And yet many people feel compelled to protect their email address as all costs. Have those of us in the industry been so loud in our warnings about security issues that people are now more wary of sharing their electronic mail address than they are about sharing their meatspace address? I have dozens of apps on my Droid. You can see my current list here. I've only paid for two of them, however. One is the Zagat's app which I rarely use. The other is Doggcatcher and I use that all the time. Doggcatcher is easily worth the $10 I spent and is the best podcatcher I've tried on the Droid. I tired the Media Fly apps, the Google Listen app, and several others. I was about ready to give up on Podcasts on the Droid until I got Doggcatcher. Unlike my iPod, there is no syncing involved. I don't have to think about making sure I have the latest content. It's just there. Unlike other Podcast and music apps for the Droid, Pause and Fast Forward work well. Since it's not streaming I never have to deal with buffering. I'm actually listening to my Podcasts more often since I almost always have my phone with me. Even when I'm walking to the grocery store I can easily be learning more stuff. With my iPod (which I still use sometimes) there are the extra steps of getting the iPod and then carrying it with the other stuff. Doggcatcher on the Droid solves that problem. It's not perfect. The list that shows what will play next is a bit confusing. It works but it's not as intuitive as it could be. The main interface also confuses me sometimes. I'm not sure exactly how to fix it, but I hope that gets more polished in time.And I'm not sure if it stores content on the SD card (which is where I want it) or on the phone (where it takes up valuable space). It boggles my mind that there are so few good Podcatcher/player apps out there. But Doggcatcher is a good one and is well worth the money. So everytime I passed those repurposed cardboard boxes filled with insurance solicitations, credit card statements, random coupon flyers, small racoons, thermal receipts, and assorted travel confirmations I could feel the growing stack of cardboard and packing tape mock me as I went out the door. I let it grow and felt the metaphorical weight of it on my shoulders as my floor felt the physical weight on its carpet. I pulled a box from the middle of the pile, cleared off the coffee table, fired up an episode of Eureka on the Tivo and dove into the layers of paperwork like the lamest archeologist ever. Layer by layer I went -- August, July, June, May -- and finally April. I slowed down and went through all those pages with a sieve. Finally, there they were -- all the receipts for that expense report, stuck in one fat envelope. I'm still not sure how they escaped my scanner the first go around, but once again, laziness and inaction proves victorious over ruthless efficiency. And my conscience no longer feels guilty about the boxes. 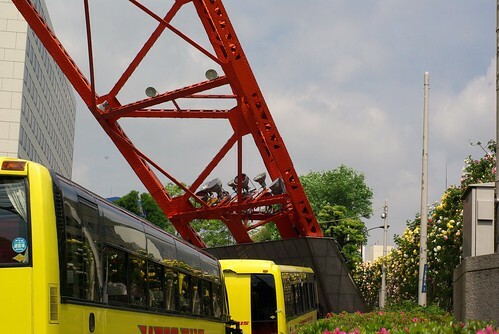 Every tourist city worth a visit has a tall skinny structure that tourists can ride to the top of. Seattle has the Space Needle. Vegas has the Stratosphere. Toronto has the CN Tower. DC has the Washington Monument. NYC has the Empire State Building. 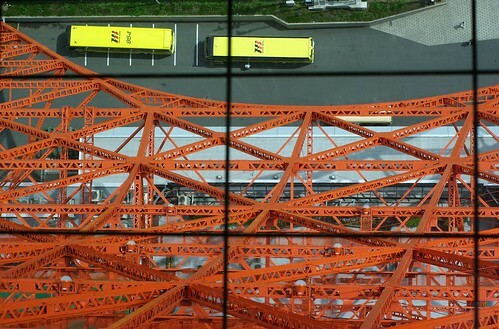 And Tokyo has the Tokyo Tower. 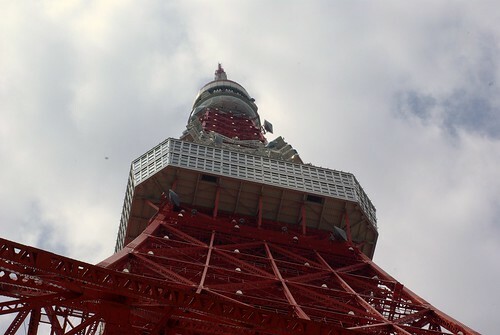 At 333 meters tall, it is 80% taller than the Space Needle. 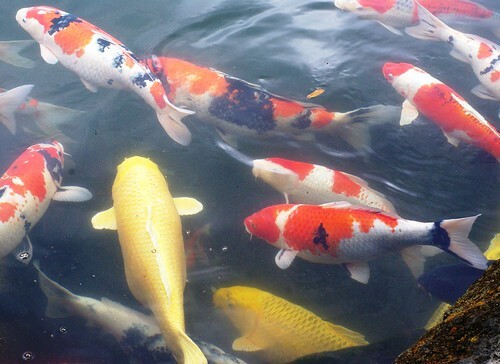 It opened in 1958 and helped symbolize Japan's recovery from WWII. And it was destroyed in nearly every Godzilla movie. When not under attack by giant lizards, it handles radio and TV transmissions (among other things) that beam silly game shows and news into Japanese homes throughout the area. It has two observation decks. Our tour grow went to the lower one because it has a bigger elevator. Even though we were at just 150 meters, the view was incredible. I like the shape of this tapered brown building. 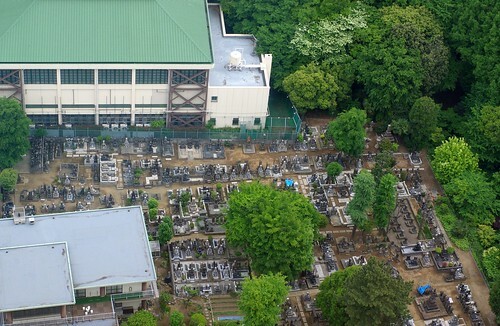 Right below the tower is a crowded cemetery. I thought the contrast between the manufactured nature of the tower, and the nature of the cemetery was quite interesting. 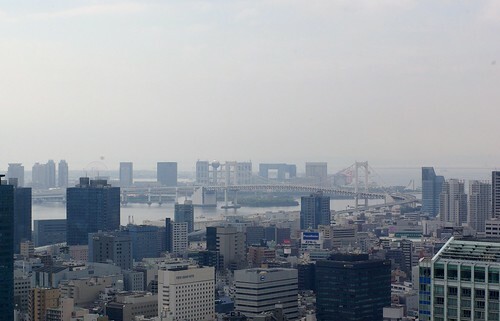 The Tower even looks out across the bay to the Fuji TV building on Odaiba. It's one thing to look out from the tower. It's another thing to look down. 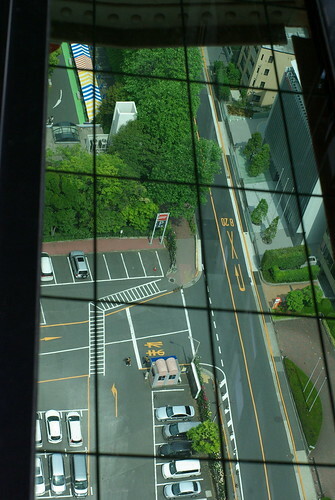 The observation deck has windows in the floor so you can do just that. Here are those same buses from on the ground. Like any good tourist tower, the Tokyo Tower has it's share of tacky gift shops with souvenirs related to the Tower and to Japan in general. Prices ranged from cheap to "Are you kidding me?!" And as with much stuff in the industrialized world, much of it appeared to be made in China. Except the Tokyo Banana snacks, which seemed to be local. And surprisingly tasty. You can also get them at the airport on your way out of the country, too. 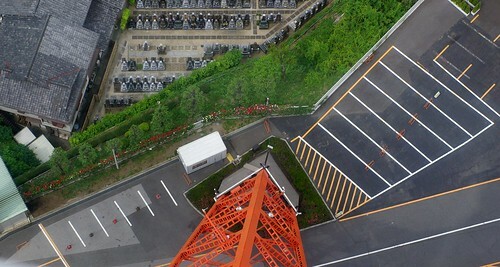 Shops and snackbars are not enough for the Tokyo Tower, though. Many for the visitors weren't even there to ride the elevator. 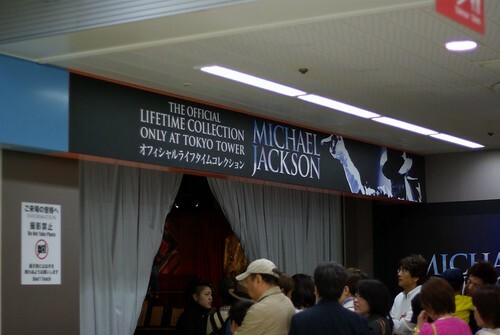 They were there for the Michael Jackson museum in the base of it. This is one of those things that makes both perfect sense and none at all -- both at the same time. We had only a short time there before jumping back on the tour bus so we skipped the Thriller nostalgia. The Tower is also rapidly becoming obsolete. 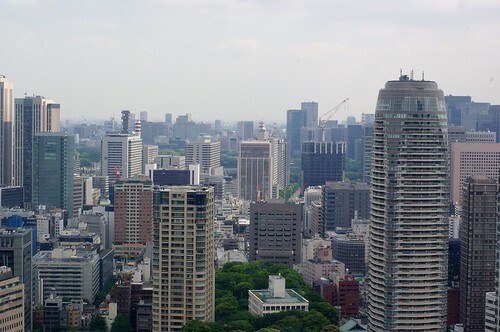 As Tokyo expanded and grew over the last 50 years, Skyscapers began blocking and interfering with the signal. 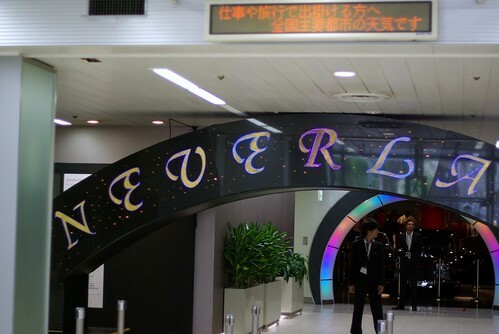 The symbol of a new Tokyo can no longer support that new Tokyo. Fortunately, the replacement is already under construction. 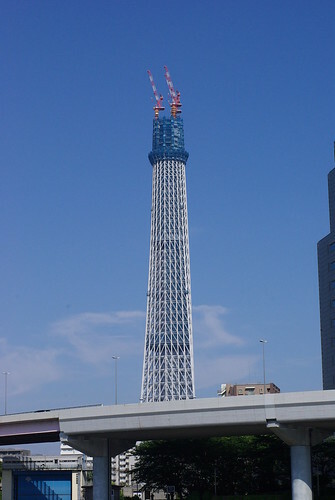 When the Tokyo Sky Tree is finished in 2012, it will be nearly twice the height of Tokyo Tower at 634 meters -- nearly 2,000 feet, and well over a quarter mile tall. 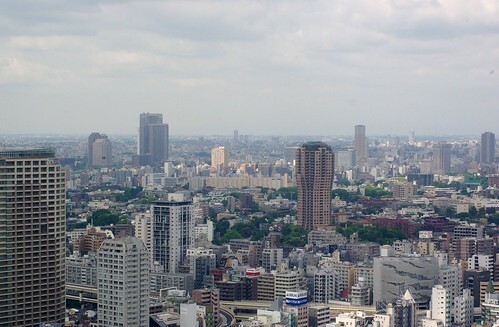 It will have observation decks at 350 meters and 450 meters. I guess we'll have to go back. 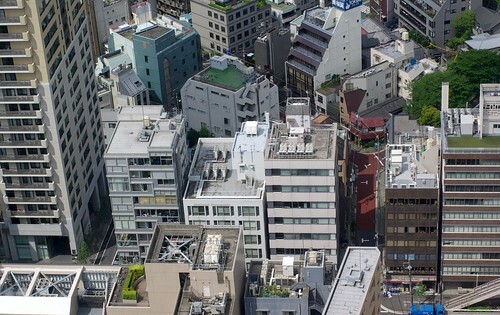 You can find more of my Tokyo posts here. The Fremont Solstice Festival is always entertaining. It's best know for the parade and its collection of naked bikers (mildly NSFW pictures here). While looking at the "official" entertainment, though, don't ignore the crowd. The people watching is awesome. 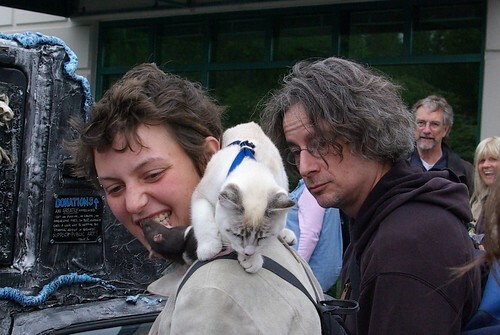 For example, folks crowded around some beautifully (and weirdly) decorated cars at the Art Car exhibit.One woman had a cat on her shoulders. The cat was very calm, climbing all around her head. That started to draw the crowd away from the vehicles as people wanted to pet the cat. She smiled gleefully. Suddenly her other pet poked out from her hair and crawled around her neck. Then it started to lick her teeth. Woman, cat, and rodent all seemed quite happy and pleased with the attention. And the gathered crowd tried to make sense of this alternative little family.